If a pet can save your life, Garibaldi Rous saved mine. 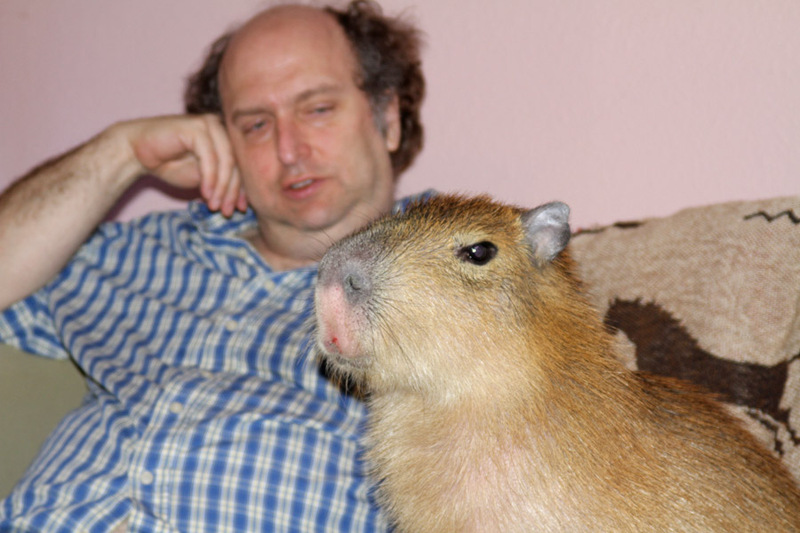 For three and a half years, Caplin Rous, my beloved pet capybara, monopolized my life. He was with me every moment it was possible. He slept under the covers in my bed. He went out to lunch with me. We went on walks together. We did school visits to teach kids about capybara and other rodents. We appeared on TV. I even wrote a book about him (sort of). And then he was gone. 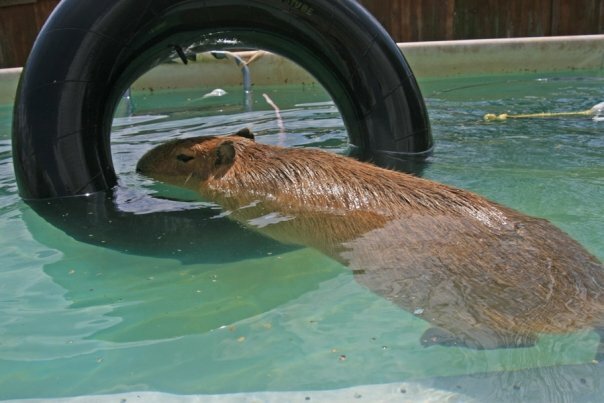 Suddenly there was a hole in my life that was much larger than a capybara. The hole seemed as large as life itself and I was falling into it. I talked to no one and I did nothing. At work I sat in my cube and stared at my computer. At home I cried. 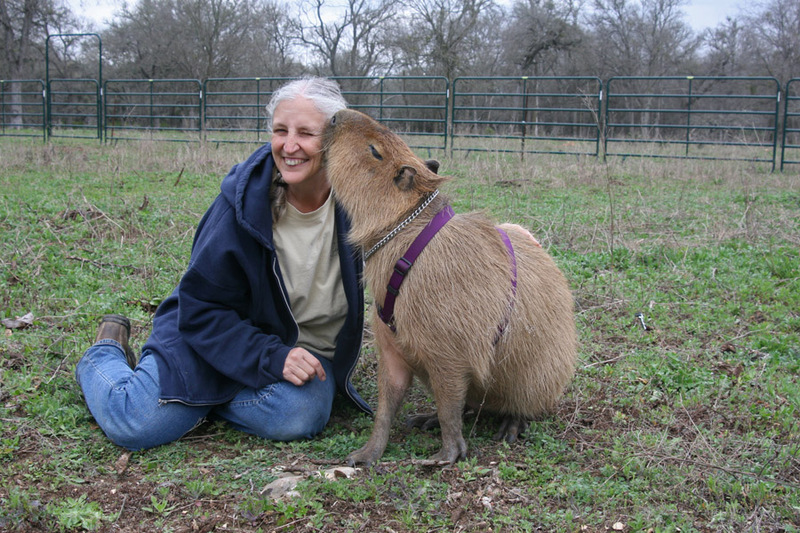 Then I heard from Justin at Kapi’yva Exotics that one of his baby capybara, now ten months old, was looking to be re-homed. 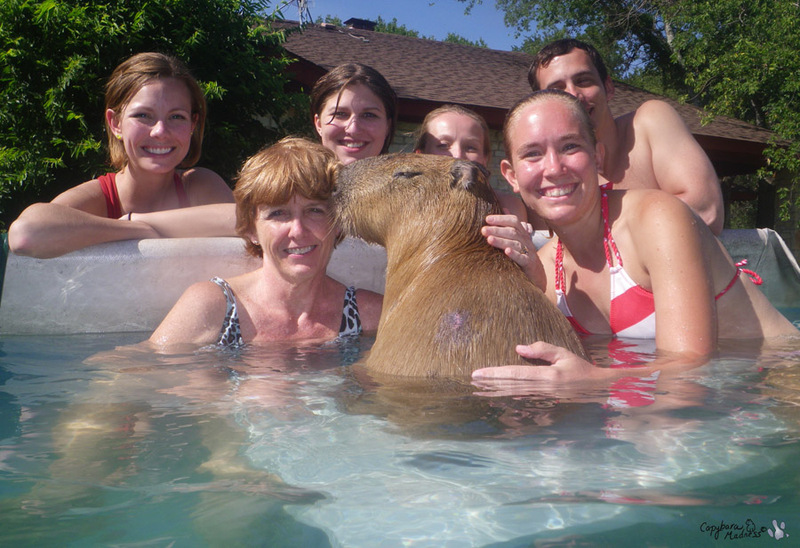 The capy was living in Ohio and had spent most of his life indoors. His owners no longer wanted him, saying he chewed their furniture, grabbed food out of their hands and was getting large enough to push down their four-year-old daughter. 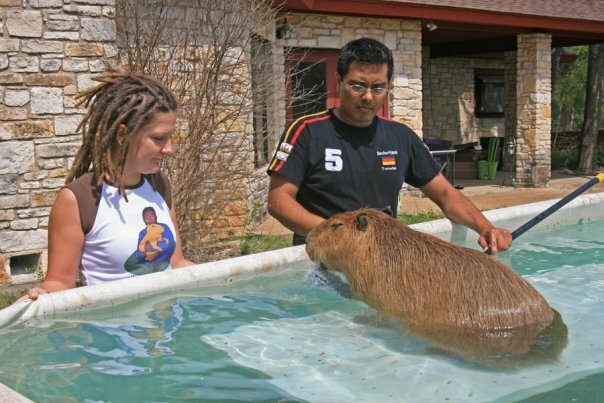 They’d been trying to sale him for a couple of months but no one was interested in a half-grown, untrained, indoor capybara. 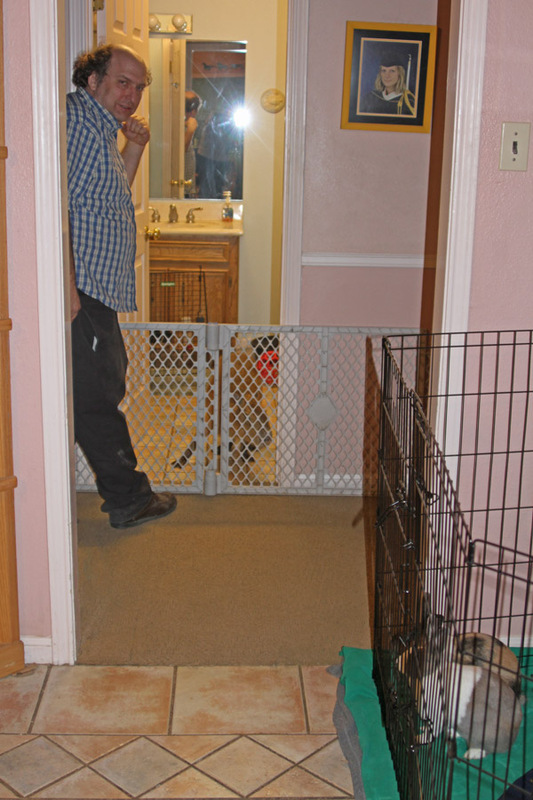 As a responsible breeder, Justin was willing to take Gary back but he would have to stay in a pen outside and would have little human interaction. Justin wanted to know if I would be willing to take Gary in. The decision to take Gary, whom we renamed Garibaldi Rous, was not an easy one. How could I even think of replacing Caplin? 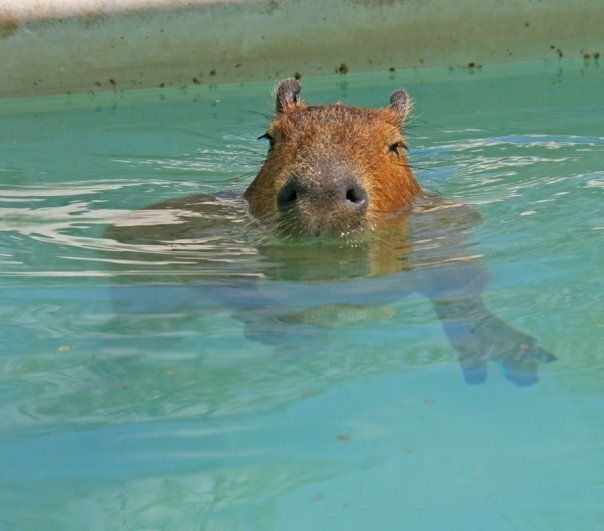 And this capy would not be, could not be, him. He would only be a disappointment to me. And it wouldn’t be fair to him. But if I didn’t take him, what would his life be like at Justin’s? I’m not saying Justin isn’t good to his animals, I’m just saying they are not pets. What would the shock of loosing his people and being forced to live outside do to a capybara with Gari’s limited life experiences? He seemed as hopeless as I felt. Proving my new axiom that there is no such thing as a free capybara, it cost $300 to have Gari shipped from Ohio back to his native Texas. I know I’m supposed to say that when Rick and I picked him up at the airport it was love at first sight, but it wasn’t. To others every capybara may look alike but to me Garibaldi differed from Caplin in a million little ways and each of those differences made me miss Caplin more. Out of the crate at our house we finally got a good look at him. He was small, only 45 lbs when at his age Caplin had weighed 80 lbs. And he was crazy. We tried to pen him in the bathroom for the night thinking a small, non-threatening environment would make the transition easier. We turned off the light, leaving a small night light to allow him to see, and closed the door. It wasn’t long before the sounds of things crashing and his pitiful eeps made us open it again. The scene was a complete disaster. He’d knocked his crate over, spilled all of his food, tossed the bath mats around and gnawed big gouges into the door frame. We stared over the gate we had blocking the doorway in amazement. Caplin would never have done this. Another thing Caplin wouldn’t have done is to jump that gate and land in Rick’s lap as he sat in his wheelchair watching. It seemed Gari had his own ideas and his own way of making his needs known. We soon learned that chewing on furniture, carpets or bedding meant he was hungry. And he was hungry a lot. 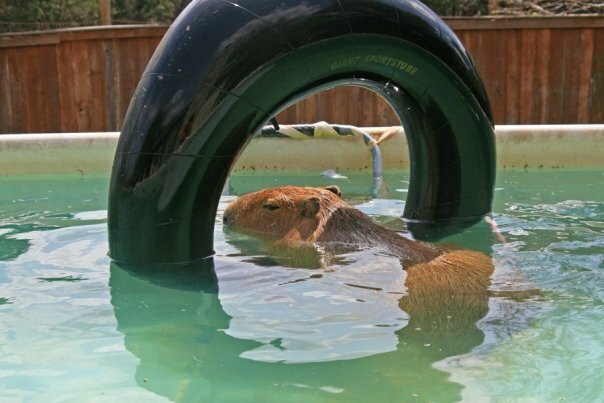 Probably his previous owners had not understood how much a growing capybara needs to eat. The first few weeks we had him, Garibaldi ate like a maniac and grew like a weed. 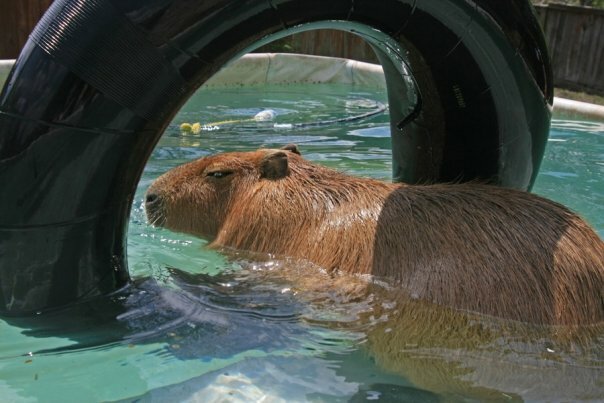 He learned to overcome his fear of the outdoors in order to graze, the natural eating habit of capybara but something he’d never been able to do before. At first he would eat anything and everything we set before him: apples, potatoes, melons, lettuce, spinach, corn, mangoes, bananas, carrots, kale, chard. As he began to understand he would never be hungry again, many of those things disappeared from his acceptable foods list. After seven months I’ve come to love Garibaldi in a way that is different but (almost) equal to my love for Caplin. 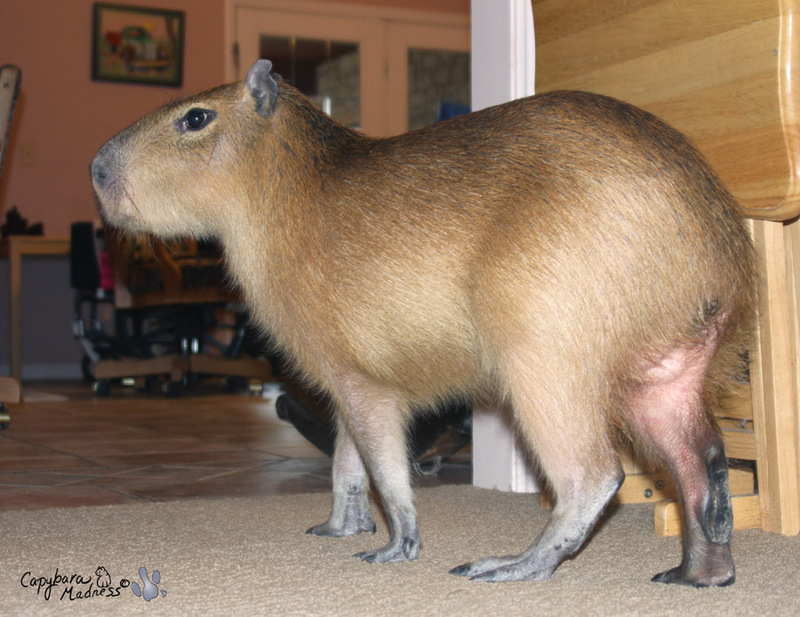 He is not Caplin and he doesn’t act like him–I sometimes wonder if they are even the same species–but he is his own crazy capy self. 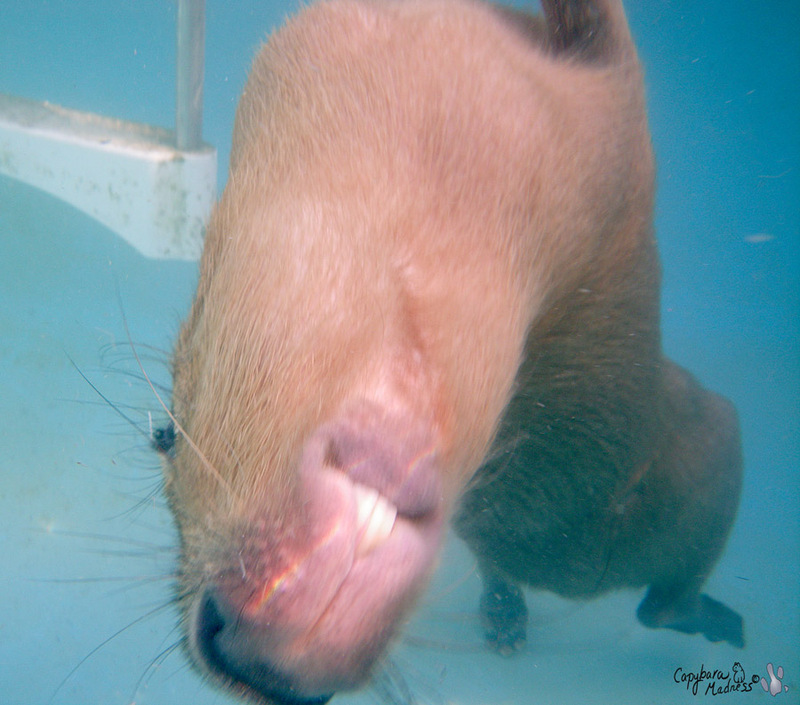 While Caplin was a dignified ambassador for capybara-kind, Gari is the clown of capybaras. Caplin panicked whenever he accidentally rolled over; Gari doesn’t even know how to stay right-side-up. Caplin was great with people we met outside our property but somewhat territorial at home; Gari is scared of things in the wide world but welcomes people at home (after an initial shyness). Now Gari is helping me promote the ROUS Foundation for Capybara Veterinary Medicine, which I founded in memory of Caplin Rous (ROUS stands for Rodent Of Unusual Size). 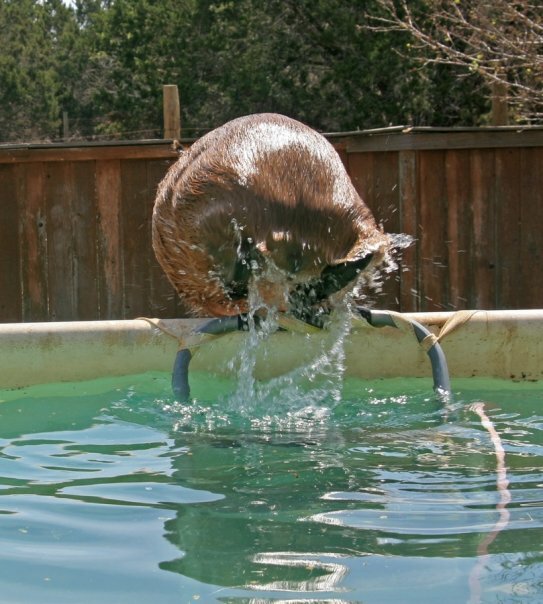 He’s had his own share of veterinary issues and has made quite a few visits to Texas A&M and the vets there have even visited us and swam with him in his pool. On Oct. 31st, Garibaldi has his first scheduled school visit. I think he will be up for it. Please do not get an exotic pet unless you are prepared to take care of it. As hard as it is to re-home cats, dogs and other domestic animals, exotics are even more difficult. What a wonderful story!! I was one of the many who was heartbroken at Caplin’s death—I started crying when I turned the calendar page to his birthday this year. I remember how hard it was for you to accept Garibara…I remember my mouth hanging open as I watched videos of him ROLLING OVER! He’s just an amazing animal, and so lucky to have you and Rick to take care of him and give him a good life. And I have a completely different personality than either Caplin or Gari. 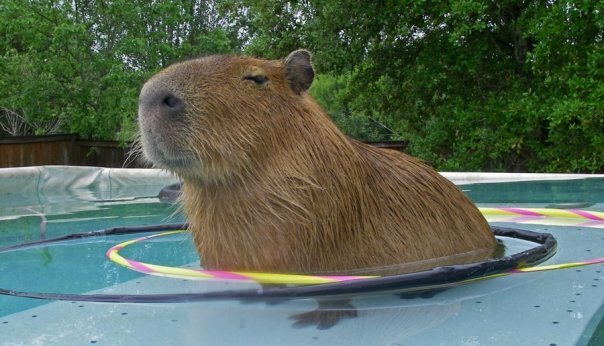 I am the Bad Boy of capybaras. I am housebroken but I am too grubby to come into the main living area of the house. I can come and go to my very own kitchen area all day long, though. I swim in any weather over 40 degrees, potatoes are one of my favorite foods, I still drink milk, and I love to have visitors, though I am scared of cats. We are all very different! Dobby, you are The Dude. Melly, thanks for this insight into Gari’s first days at Chez Typaldos. (I’d love to hear more about his bonding with Rick.) We’ll all miss Caplin forever, but the saga of how you and Gari saved each other warms my cold old heart… enough so that I forego a rant about the irresponsibility of the Iowa family who seemed to think they were buying a guinea pig. So glad things are working out with Garibaldi. I loved following the life of Caplin, and now it is a real pleasure to read about Gari’s antics! Let us know when the Gari plush is available! 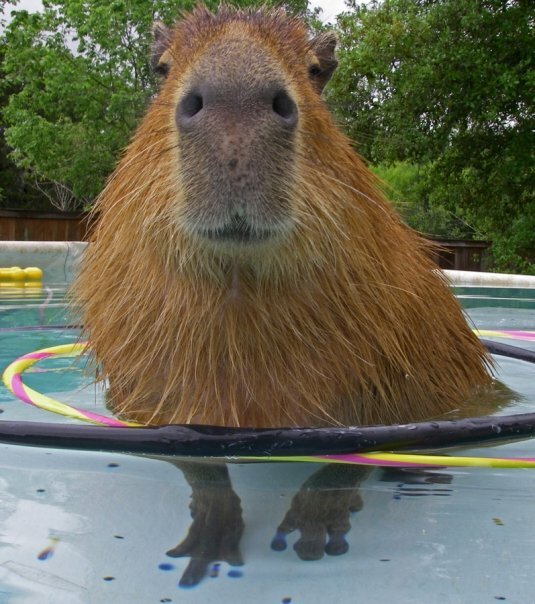 Thank you for illustrating that each capy has its own personality, and is lovable each in its own way. This is a very special story and important for people to witness, because dogs and cats are not the only pets that can steal our hearts. What a beautiful story! Melanie, your ability to evoke images and emotions through the words you write never ceases to amaze me. Thank you for sharing your story of Caplin AND Garibaldi with us all. Great post! I love the pic of Gari upside down in the water. I was in tears when I read your story. It was so poignant and heart-rending. I cry for you Melly and your loss which is unbearable, I cry for Caplin who I had grown to love, and I cry for Gari because of his unhappy start in life and because when he arrived he wasn’t very lovable but it wasn’t his fault. Each time I read your story I cry. I can’t help wondering how Gari was treated in Ohio. Was he ever hit? I’m certain he only grabbed the food because he was absolutely starving. If you have a slightly out of control animal that you want to get rid of, are you going to be as kind to it as you should be? I wonder where Gari sleeps at night now? I can’t help wondering how Gari was treated in Ohio. Was he ever hit? I’m certain he only grabbed the food because he was absolutely starving. If you have a slightly out of control animal that you want to get rid of, are you going to be as kind to it as you should be? It’s a heart-wrenching story, although you wrote about certain things before. You just understand what a great responsibility it is to take care of an animal who can not in many cases even tell you about his needs. But i can feel his fear and horror and desperation on arrival. What a relief to learn he’s under your roof. This was a great story. Thank you for sharing. May you have many happy days, hours and years with gari. Oh my! This brought back the whole terrible loss & shock of Caplin;I think ALL your fans went through the sorrow w/you. BUT on the bright side we now have little Gari-poo!! !I so enjoyed the complete story of Gari.